You are Corvo Attano, the bodyguard of the Empress who rules the plague-gripped city of Dunwall. When the Empress is assassinated and her daughter is kidnapped by usurpers to the throne, you are framed for the crime and must join a band of loyalists to eliminate the traitors and save the heir to the throne. Along the way, you acquire a variety of gadgets, skills, and mystical powers to help you vanquish your targets, through assassination or other means. 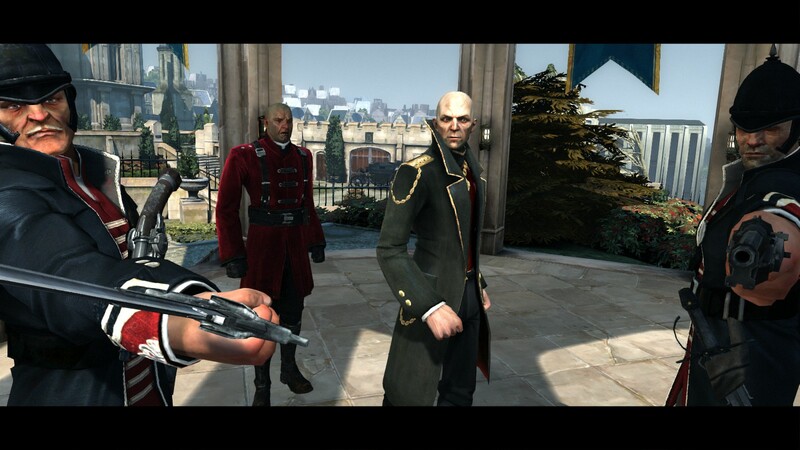 Dishonored is a game that feels as though it had lofty ambitions that were never fully realized. It has solid stealth-focused gameplay and outstanding world building. On the downside, its pacing is broken, the writing (particularly the dialogue) is poorly executed, and parts of the game feel truncated, as I will detail further on. Even so, I thoroughly enjoyed the game once I found myself getting into the flow of sneaking, sabotaging and surgically eliminating my targets. First, the good. 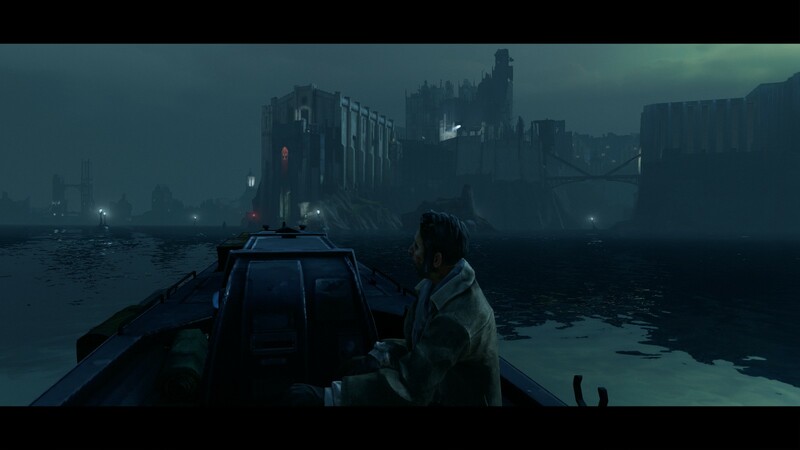 Dishonored‘s stealth gameplay is some of the best I’ve seen since Thief: The Dark Project (Dishonored drops a pretty blatant homage to it at one point). Sneaking through shadows or skulking on rooftops is fun, the mechanics work smoothly, and your powers are well-suited to the task. I’m particularly impressed that neither cloaking nor invisibility ever become part of your arsenal. The designers instead opted for manipulation of time and space, allowing you to vanish from one spot and appear in another, or to stop time so that you could saunter past guards and defenses unmolested. This shows a level of creative challenge that I greatly appreciate. A small but extremely welcome mechanic gameplay is the way that guards will not immediately surround you if you are spotted. If you’re quick enough, you can slip back into hiding or teleport to safety before your opponent confirms that you are a threat. I’ve called this feature “oh sh*t space” in the past; that brief moment where you realize you’ve made a mistake and need to rectify it immediately. Coming around a corner and realizing that a guard on the balcony above has just caught a glimpse of you before you slip under a nearby bench is an example of just such a moment. Unfortunately, many games where stealth is not a primary mechanic treat enemies and NPCs as what they are; hyper-alert kill-bots that instantly recognize you as a threat and descend upon you like the fist of an angry god. Instead, Dishonored treats them as human beings, who generally try to confirm what they’ve seen before filling the space you occupy with steel and lead. This gives you that short window of time to make the decision to fight or flee, making the experience more organic and less frustrating, because you can correct minor slip-ups. On the downside, once they do engage you, the NPCs in Dishonored never seem to treat you as the incredibly deadly master assassin that you are. A single guard, isolated from his allies, will draw his sword and try to fight you regardless of the fact that you are a notorious outlaw known for slitting throats and bending space-time to your will. Even if you have a pistol leveled at their heart, they will attack without hesitation. While I admire their dedication, it feels strange that not one of them is afraid of you, even after stabbing, poisoning, or shooting your way through them and their leadership. Now that we’ve gone over some of how the world feels as you move through it, it’s time to move on to how the world is written and presented from a narrative standpoint. The world that is built up through the notes and books you find is immense and fascinating. There is wariness and wonder at new technology. Those tied to the whaling industry that provides the fuel for this burgeoning industrial world both extol the virtues of their trade and lament the cost in lives and natural beauty. Guards complain that they didn’t need the awesome power of lightning-firing pylons or walls that disintegrate flesh before the world got out of hand. It all speaks to a world that is vast and complex, where people have mixed feelings, but are still trying to get by despite the horrors of a deadly plague and the harsh nature of everyday life. However, this is not borne out in any of the dialogue. Characters speak in a flat monotone, deflating any sense of urgency or motive in their words. Like a high-school senior reading Shakespeare for the fourth time, the words are just being spoken from rote, with no thought given to the character’s background, motives, or personality. For example, Admiral Havelock is a career military man who has been ostracized due to a power-grab by selfish politicians. You’d think he would speak with passion and conviction, but every line from him is dry and lacks any sense of weight. Worse yet, some of his lines run into one another, as a snippet of dialogue starts without any hesitation after the last one has finished. It lends most of the characters an unearthly, robotic tone that doesn’t match their creatively rendered appearance. While your allies feel like they lack characterization, your enemies are often far worse. For several, you have no meaningful interaction with them prior to assassinating them, and only the word of other NPCs to go on that they are in fact worthy of death or worse. This makes it hard to know just how evil, ruthless, or even conflicted these people are, since we have so little personal interest or knowledge of them. When you do find out about a major antagonist’s “cunning” plan, it comes across as cartoonishly evil and completely unworkable. He ceases to feel like a legitimate threat, and much of the satisfaction in removing him is lost. A particularly egregious example of this lack of background on the villains comes from Lady Boyle, to whom we have virtually no introduction. We are told that she is a financial backer of your primary assassination target, so her removal makes sense, but killing her (or the even more vile non-lethal option) seems extreme. To the best of my knowledge her acts of villainy seem to be being rich and betting on the wrong horse. Why no option to blackmail her, or persuade her to fund your cause? With no observation of her being anything more than snobbish and shady, it’s very hard to justify her murder. The tone-deaf presentation of the characters is mirrored by the lack of effective pacing in the game itself. In a game with good pacing, their is a steady upswing in the action, leading into a rhythm of conflict, punctuated by energetic moments like boss fights or plot points, as well as lulls where we can see how things are when chaos is not erupting from every seam in the world. 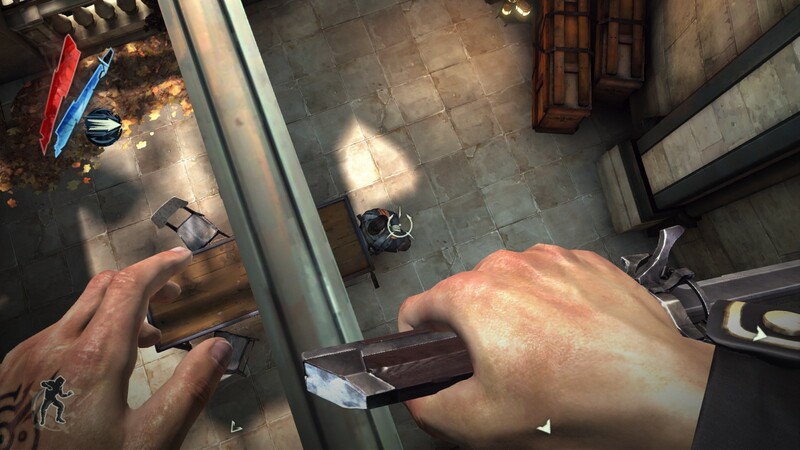 Unfortunately, Dishonored fumbles this early on and never quite gets its bearings. Right at the beginning, you are fighting with sword and pistol against enemies we cannot kill and can teleport in and out of existence at will. Then you’re expected to suddenly be sneaky and slit throats or drag off unconscious guards without having any real experience with it prior. Without a safe, low-consequence environment for players to experience a game’s core mechanics, the early stages can be extremely frustrating and grind what should be the gradual rise in action to a halt. After the introduction, the pacing remains a sticking point, as you waffle back and forth between high-tension infiltration and futzing around at your fellow conspirators’ headquarters. The story compounds this by throwing in a completely predictable betrayal (admittedly, effective betrayal is hard to pull off in any medium), then leaving you with a measly three missions to wrap up the game, two of which don’t even feature the people who betrayed you. It feels as if a much larger final act was planned, but had to be scrapped due to time or budget constraints, and the ending was revised in the most basic way possible. This absence of effective rise-and-fall in the action is further exacerbated by the smallness of the world. For all its written grandeur, the city of Dunwall feels incredibly tiny, with only a few neighborhoods (one of which is even used twice right at the start), and no chance to see many of the more colorful parts of the city. You never see a market, a theater, or even the inside of one of the vast whaling vessels bringing its catch in for processing. There is a massive clock tower that dominates the skyline during multiple missions, yet it remains forever out of reach. 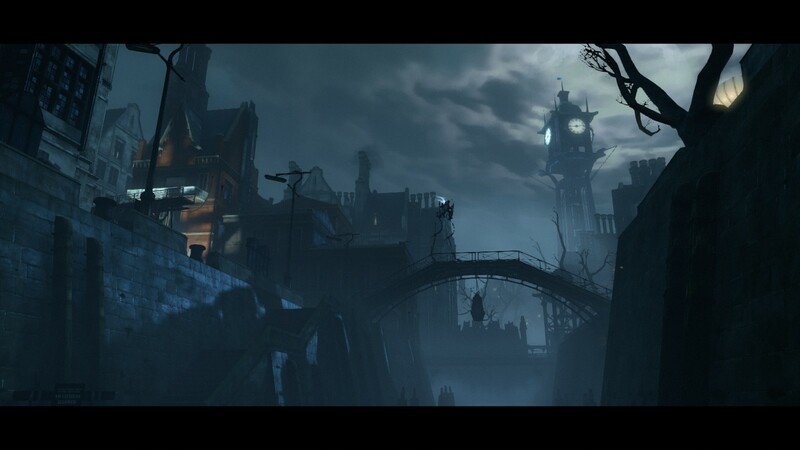 Instead, the majority of the game takes place in abandoned residential areas, sewers, and military fortresses. More locations that offer a change of pace or the ability to move through crowds, like the mission in which you infiltrate a party and can move freely amongst the guests, would have helped make the world feel more alive and less like fixed set pieces. In conclusion, Dishonored is a game that takes one step back for every one it takes forward, but is still worth your time if you want to scratch an itch for stealth-focused gameplay. I’ve played through it multiple times, and enjoyed it immensely despite its flaws. Sneaking around and hunting your prey is thrilling and can build up wonderful tension, but that tension is often let down by lackluster writing and worse delivery. The world is written to be vast and intricate, but the locations you see feel small and lack any sense of grand scale. I applaud the developers for getting so much right, and I hope that they will have the opportunity to learn from their stumbles and capitalize on their successes.